The production of the primary aluminium is a recognisable marker of our company. This is not just the production; it is a story, an inspiration, a centre of our activity and the activity of our predecessors. It has been for more than 60 years. 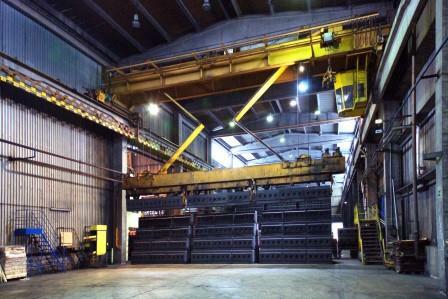 Since we belong among top-notch producers of the primary aluminium, we believe that the story of the aluminium in Kidričevo will continue with success. 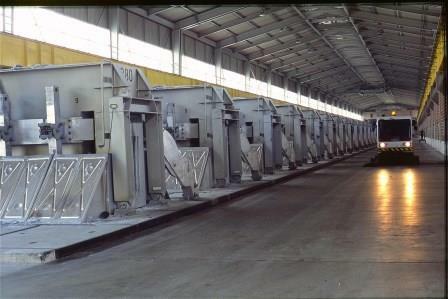 Namely, at the end of 2007 we stopped producing aluminium in the electrolytic hall B, where aluminium had been produced since the very year 1963. Abolishment of the electrolysis B was a part of the production restructure, with which Talum switched to a new strategy of development. Without the electrolysis B the production in Talum was completely in accordance with ecological standards IPPC and with the Environmental Permit given by the Ministry of Agriculture and Environment, the Agency of the Republic of Slovenia for the Environment. A centre-point operation of the electrolytic cell is built into in the electrolysis C, which is of high current intensity. The cells are operated by using modern mechanisation and automation. A process computer runs them. They are closed and connected with a system of accumulation and dry purifying of gasses. Currently this is the latest technology developed by a French company Aluminium Pechiney. The production process in the electrolysis C is almost completely automatized. Automatic regulation of the electrolytic cells is performed by a process control system, which is organised in two levels. The first operates with each individual cell; the second is for managing the complete electrolysis. Hence, each cell has its own microprocessor, which automatically regulates inter-electrode spacing, crust penetration, dosage of alumina and aluminium fluoride. All microprocessors are connected with a central computer, which carries out measuring and converting voltage and current in the electrolysis, alerting, data processing and saving. To perform operations with the electrolytic cells in the electrolysis there are special multi-purpose lifts. All electrolytic cells are covered and connected to the purge of gasses through gas tank pipelines. Purifying of gasses proceeds with a dry process. Fresh alumina absorbs fluorine and then it is collected through baggy filters and transported into the process in the electrolytic furnaces. Efficiency of the system is extremely high, 97% at gasses collection and 99% at their purifying. The anodes are positive electrodes by galvanic particles, electron tubes, semiconductor diodes, and electrolysis. The name comes from Greek and it means the way up, the way where electrons rise up out of the electrolyte solution. We use them in the electrolytic cells in the process of the aluminium production. The cathodes are negative electrodes by galvanic particles, electron tubes, semiconductor diodes, and electrolysis, where a chemical reaction of reduction proceeds. We use them as a cathode bottom in the electrolytic cell during the electrolytic production of aluminium from alumina. How does the production process proceed? 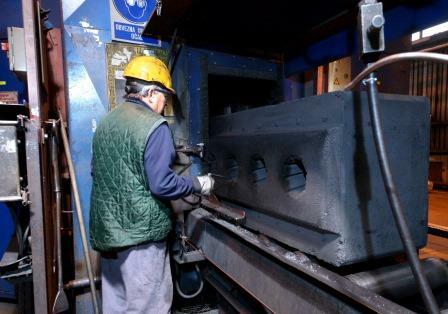 forming green anode blocks of a wanted size on a vibratory press. 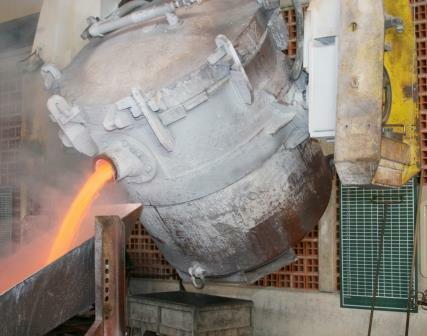 We bake the green anode blocks in a calcining furnace at the temperature of 1200°C. By baking, we improve solidity and electric conductivity. Before the use in the electrolysis, we construct the baked anodes in the anode set with an anode girder. Thus, we get filled anode sets, which are then used in the electrolytic process of the aluminium production. We buy the cathode blocks as a final product. By using grey cast, we fill the blocks’ steel current conductors and construct them in the cathode set.